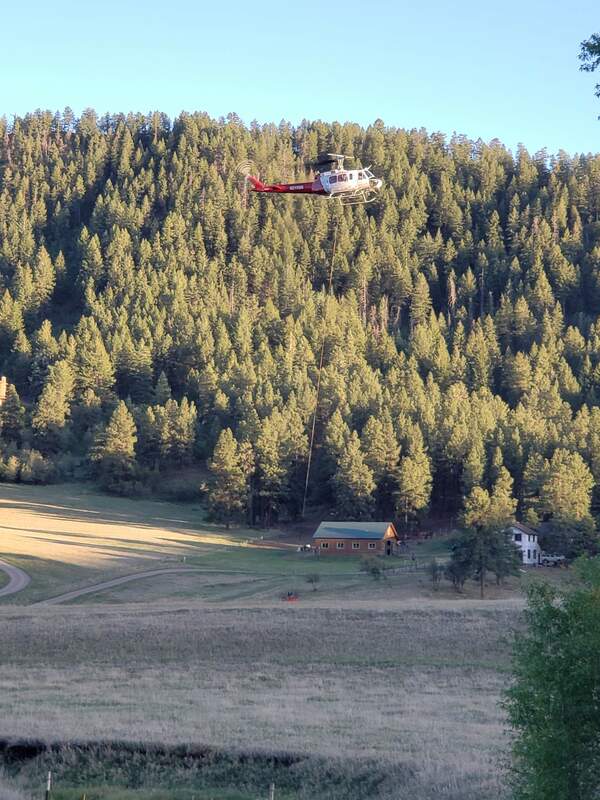 A helicopter picks up water Friday afternoon to fight the 358 Fire near Texas Creek northeast of Durango. Aircraft from across the region helped fight the fire that consumed more than 50 acres. During the fire, Upper Pine River Fire Chief Bruce Evans observed “very erratic fire behavior.” For example, cottonwood trees that normally soak up water and tend to be more fire resistant burned quickly. Hitting the 358 Fire northeast of Durango hard and fast with helicopters, planes and a hot-shot crew helped control and contain it. The fire was started on private property Friday afternoon by someone shooting recreationally. Before it was extinguished Monday, the blaze consumed between 51 and 53 acres, Upper Pine River Fire Chief Bruce Evans said. No structures were damaged and no one was injured in the fire, he said. “We were very fortunate,” Evans said. A state aircraft scanned the fire with infrared technology to look for hot spots, he said. Ground crews also patrolled the area Monday, he said. The quick air response started Friday afternoon when firefighters called in the first helicopter from the Durango Air Tanker Base as they were heading out to the fire, he said. Other aircraft from across the region also joined the fight, including a helicopter from Towaoc, a helicopter from Mesa Verde National Park and a heavy air tanker from Albuquerque. Some of the aircraft were in the area on other missions but were redirected to the 358 Fire because it was close to 400 homes, Evans said. The Tween Lakes and Enchanted Forest subdivisions were placed on pre-evacuation orders during the fire. In addition to calling in aircraft early, firefighters got lucky because on Saturday skies were overcast and the wind was fairly calm, Evans said. At the peak of firefighting efforts, more than 100 people were assigned to the fire. The ground response included two hot-shot crews and a Type II hand crew. Hitting fires hard with lots of equipment within 24 hours of ignition has become more common over the last five years because the Colorado Division of Fire Prevention and Control has evolved and more state funding is available to fight fire, Evans said. The cost of fighting the fire will likely be shared between federal, state and local agencies, he said. mshinn@durangoherald.comThis story has been updated to correct the description of specialized fire crews that responded to the fire.